ask the audience? 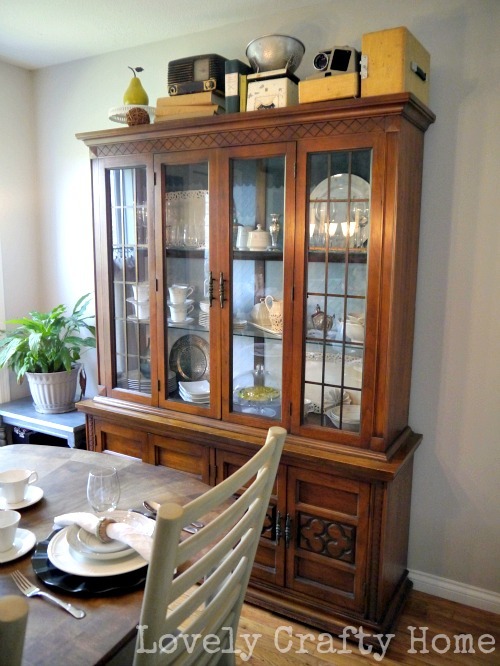 Since I’ve been unable to decide on a color for my china hutch, I thought maybe I’d ask you all and see what you thought. 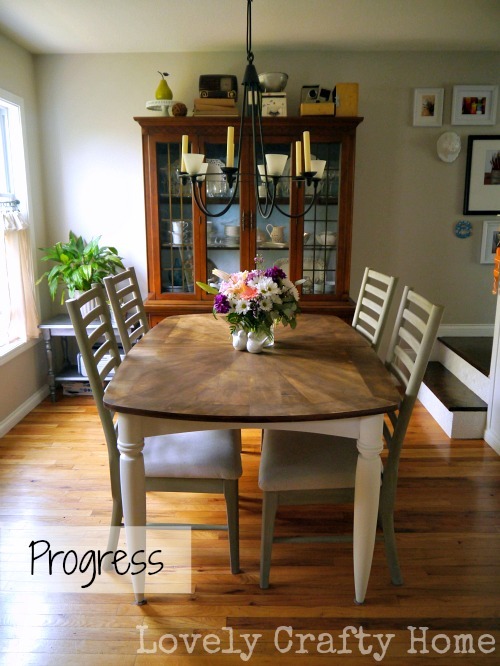 Last week, I told you how I finally bit the bullet and chopped the tops off of my dining chairs. Then I painted them (again). So here’s where things stand now. I’m ready to paint the hutch, now that I’ve mostly solved my chair problem (I still have 4 chairs to paint…) I’ve been thinking about this for a little while and somehow got the idea to paint it yellow. I saw a yellow hutch on Pinterest or something, and I was totally obsessed with the idea of having one too. But yellow is hard. We don’t get along, generally. I thought surely there must be some perfect yellow out there- that someone else had discovered. I’m certain I reached the end of the internet tracking down enough rave reviews for Sherwin Williams White Raisin to satisfy my doubtful mind. Somewhat hesitantly, but willing to give it a go, I rolled up to SW and bought a sample quart. I tested it out on a couple of chairs for my antique booth, and it sure was pretty! So pretty, that the chairs sold before I got a chance to take some pictures. #blogfail. But trust me, they were the perfect buttery yellow. Not pastel, but warm and cheery. Would “cute on chairs” translate to “totally amazing, I don’t know why I didn’t paint it sooner hutch?” The hutch is huge- huge enough to make me question any color, especially yellow. And as much as I like to paint and re-paint things (um, yes I just read that as crazy also), I’m really only trying to do this once. Oh and don’t worry about the blue fish scale on the inside…that will be changing depending on the color I choose for the outside. Also in the running is Cottage White, by Behr (currently on the table legs as a tester, replacing SW Creamy). I briefly considered pear, and decided it was out. 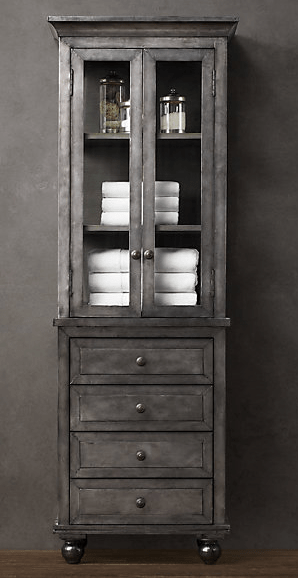 I have about 50 shades of grey (oh yes, that just happened), but the walls are grey (Behr’s Burnished Clay) and camouflage is not the goal. 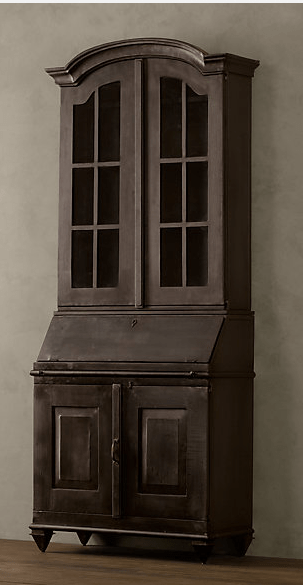 I just want the hutch to fit in perfectly with my rustic glam style, is that too much to ask? Maybe I’ll go metallic. Too crazy? I’d like to go lighter in color, but I suppose at this point I’m open to all suggestions. So what do you think? White? Yellow? Metallic? Some other color? 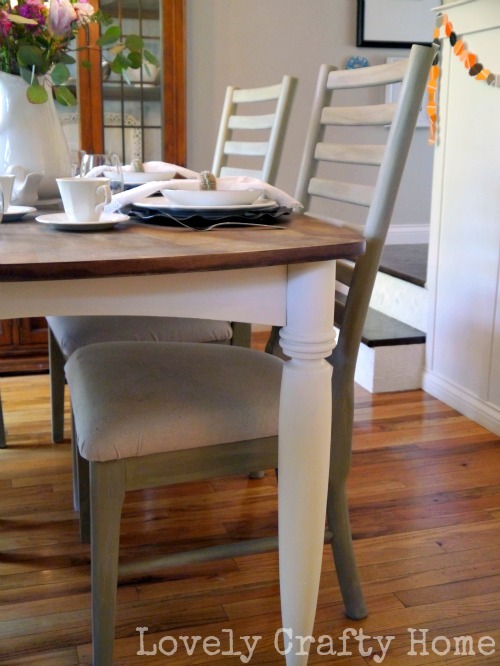 Would you paint the table legs to match? OOh I love the metallic!!! I love the swedish brasserie to give it that change up. not crazy about the zinc collection for this room. I think the white raisin will look great! Not crazy about the metallic for such a big piece though. The chairs look great too! !